Guided hiking trips for all ages and experience levels. 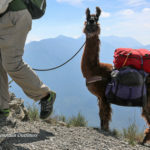 All of our multi-day llama treks are guided llama camping trips. Swan Mountain Llama Trekking can provide a great family activity, sure to be full of everlasting memories. We offer several types of treks that easily fit into any Glacier Country vacation. 4-8. Smaller groups may be combined. Larger groups can be accommodated by special arrangement. Children are welcome (generally ages 7 and up). Our overnight guided hiking trips run 7 days-a-week. Our trips are scheduled as guides/ llamas are available. Operating season is June 15 through September 15, with our overnight trips primarily in July to the first week of September when the high country is accessible. We hike 3 to 8 miles a day, covering a maximum of 50 miles. We are able to custom-design shorter or longer trips. Our pinnacle trip into the Bob Marshall Wilderness is the ultimate backpacking/trekking experience and unlike any other trip offered in Montana. 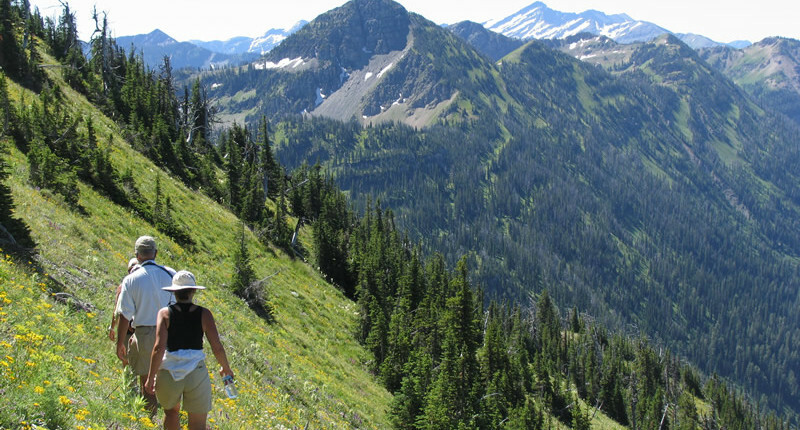 Hassle-free guided hikes in Montana’s mountains. 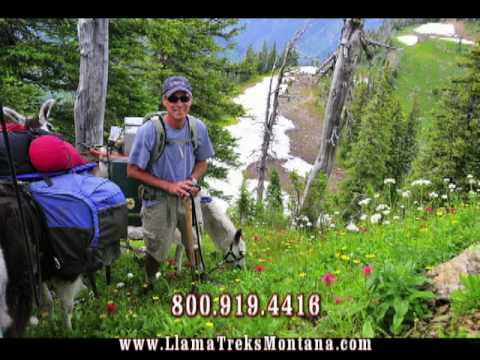 Swan Mountain Llama Trekking is located in the scenic Swan Valley, a renowned outdoor recreation destination. While you’re here, float the Swan River, ride horseback or take a wagon ride in the Swan Valley. 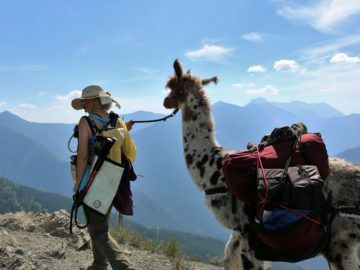 You can also combine your llama trek with any one of the trips offered by our sister company, Swan Mountain Outfitters, or by our many business partners. Our Alpine Trail pack trips are on the Swan Divide in the Flathead National Forest, which is surrounded by Glacier National Park, and the Bob Marshall, Great Bear and Mission Wilderness Areas. Our trailhead is near Swan Lake, off Highway 83. The Swan Valley is about 3,000′. The Alpine Trail ranges from 6,000 to 7,500′. The hiking is moderately strenuous, on a ridge top trail with a lot of up and down. We go at a leisurely pace with plenty of time for rest stops, lunch breaks and marveling at the fantastic panoramic views. Personal gear (clothing, toiletries, sleeping bag and pad). Most guests bring a day pack for their camera, book, sunscreen, water bottle, etc. You will receive a “What to Bring” list when we receive your reservation and deposit. Delightful llamas, friendly guides, cooking/camping/first aid gear, tents, and food. We have sleeping bags available for rent. game delights. Of course, if we fish on one of our trips, you will have a rocky mountain trout dinner like no other! 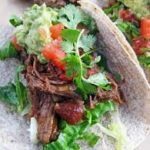 Check out a sample menu here. Our guides have varied backgrounds as backpackers, skiers and outdoors fanatics. They have been trained in wilderness first aid, and many of them guide for other operations outside the summer season. They will have plenty of time on the trail to tell you about their interesting lives and fascinating backcountry experiences! There are one or two guides on each trip. Swan Mountain Llama Trekking offers the ultimate guided hiking trips through some of the most spectacular scenery in Glacier Country!